Liz McTernan | Join my Para-sport journey! I’ve qualified for the 2019 Ironman World Championships in Kailua-Kona, Hawaii, having won my division last year-but I’m not going to accept my place! Last August, whilst I was training for my second attempt at Kona, the International Triathlon Union (ITU) announced that the female Paratriathlon wheelchair athletes (PTWC) would have a medal event for the first time at the Tokyo Paralympics in 2020. 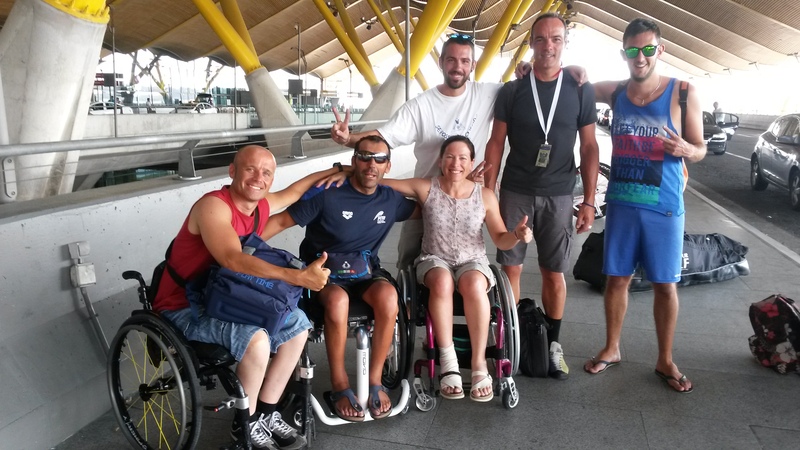 Paratriathlon debuted at the Rio Paralympics in 2016. 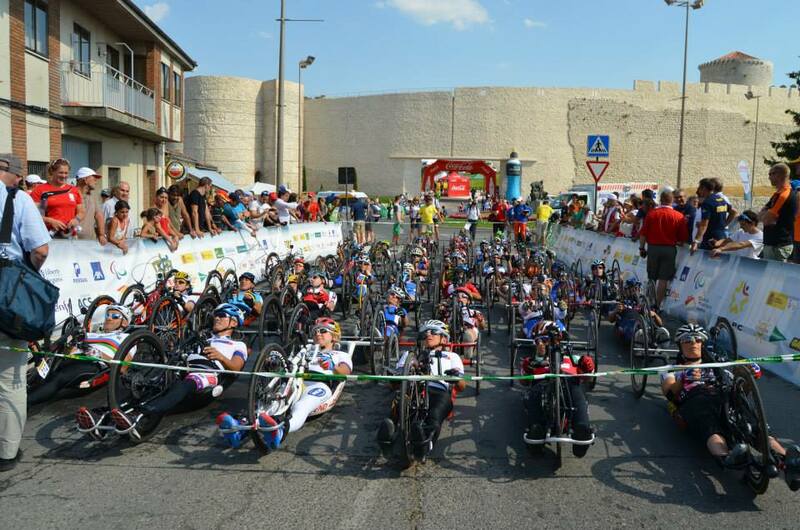 I first competed in Elite ITU Paratriathlon in 2011 where I won two silver medals at both European and World level. In 2012 I won a bronze medal at the World Championships, but without a focus of a Paralympic Games in my sport, I decided to fulfil my ambition to be an Ironman. Although I experienced a few hiccups along the way, I finally achieved my dream. I’ve obviously trained for the past two years at Long Course Triathlon but this year my training has changed radically. The Paratriathlon is contested in Sprint format, consisting of a 750m swim, 20km bike (hand bike), 5km run (racing wheelchair) so the pace is so much faster. The number of women competing has increased dramatically since I started and the standard also has, so I’m curious to see where I might place. I’m hopeful that all my aerobic training will pay dividends! The qualification period for the Tokyo Paralympics begins in June and there are world Paratriathlon series races in Milan, Yokohama, Montreal, Edmonton and Lausanne this year. I have no idea how I will be able to participate just yet, but an opportunity of qualifying for a Paralympics and potentially being a Gold medalist is driving me. The Van was especially fitted out to hold all my adaptive sports equipment, all my camping essentials and even had a special Kennel for my dogs Monty and Smudge to travel safely with me. We all had many adventures in ‘Viva’ travelling as far east as the Czech Republic, south to Italy, north to the Netherlands and throughout the U.K. The Van enabled me to travel cheaply, using the EuroTunnel and Ferries to get to Para-cycling and Ironman competitions in Europe, carrying both my Hand cycle and Racing Wheelchair, plus my race wheels, tools, spares, which meant I wasn’t restricted by weight or worried about damage unlike flying. Now I am without transport and living in rural Lincolnshire is proving logistically difficult even to get to swim and gym training in my local Town, six miles from where I live. I’m lucky to be able to train on both the Hand bike and racing wheelchair directly from my front door, but travelling abroad is a different challenge altogether because of the sheer size of these two pieces of equipment. I’m currently looking for a new Sponsor for 2019, who might help supply an adapted Van. I have new goals for next year and there will be lots of foreign travel, trying to gain vital qualifying points for the Tokyo Paralympic Games in 2020. I hope you would like help me on my journey! I took a year out of Para-Cycling to train for the Ironman World Championships. I spent many hours doing solitary swimming, biking and running and then failed to deliver the result I was more than capable of in Kona. To say it preyed on my mind is an understatement. I went over and over the race in my head, asking myself how I could miss the combined Swim/T1/Bike Cut-off by the smallest of margins, by less than two minutes. I couldn’t face the prospect of failing again, or waiting another year to prove that I could do it. So I booked Ironman Cozumel six days after Kona, and retreated from Social Media, not telling anyone except my Coach and children. Unfortunately, I was sick for three weeks after racing in Kona with an infection. It’s fairly typical for an athlete pushing their limits to become ill once the pressure of competing is off, but it wasn’t the best timing. I fitted in training as best I could, and wondered if I’d actually just wasted a lot of money. There was a Public Holiday the next day in Cozumel of course, so all flights were fully booked for the next few days. My only option was a flight to Cancun which proved a struggle to eventually get, and a Ferry across to Cozumel. I was relieved to not have all my adaptive equipment with me! The Ferry Terminal was 45 minutes from the Airport by Taxi and I was carried up a steep ramp in my wheelchair, whilst Wendy and her lovely family helped me with my luggage. I’d booked my Hotel online and emailed to ask about an ADA room, having seen that they had facilities for Disabled Guests. I should have known better. I arrived to be told that access to my room was via a narrow path, a steep grassy bank, a step and through the patio doors. I couldn’t manage it unassisted and literally wept with frustration. I was really down about having to manage yet another trip as a Para-Triathlete solo, compounded by not knowing where my adaptive equipment was. I was in Cozumel, but where was my kit? I’d arranged an Airport Transfer through the Ironman website and the Employees of Olympus Tours were marvelous, despite me having missed my pick-up. A more accessible hotel was arranged for me the next day, and they phoned the Airport in Cozumel and I took a Taxi to meet them to collect my luggage. Once I was back with it all, it was a race against the clock to get at least my bike put back together in order to test it out before dark. It was dusk, not a very sensible time to be out on unknown roads on the wrong side of the road, but it was already Tuesday and my race was only four days away. I put four sets of lights on my bike and helmet, a six foot flag pole up with fluorescent flags, and set off, having been told about a bike path to find. I hadn’t gone far before I saw flashing blue lights in my mirror and the Police pulled alongside me. Apparently I had missed the bike lane, so they escorted me onto it and asked how long I would be. I decided not to push my luck and turned round shortly after, only to get stuck on a speed bump getting back. Luckily, a very nice Moped rider stopped to lift me over. No matter where in the world I have travelled to race, I have always found incredibly kind people who have helped me out. I call them my Guardian Angels, as they appear at just the right moments. Barry and Cindy Faust, a lovely American couple, were staying at my new Hotel and we got chatting about all things Ironman. Barry had hoped to compete, but bone cancer treatment called a halt to that, so they travelled to Cozumel for a holiday in between Chemo treatments. We had a laugh taking part in the Underwear Run for charity and winning some raffle prizes, then they volunteered to help me rack both my hand bike and racing wheelchair. The race chair was easy, it was just a short walk from out Hotel to T2, but asking Volunteers exactly where to leave it, when everyone else was hanging up plastic bags, took some time to sort. Coaches had been laid on to get to T2 from all the official Hotels, but my hand bike was too high for the luggage compartment underneath. I doubted it would go onto the bus, but with some extra hands, it sat across the tops of several rows of seats. Then there was the additional manhandling of both myself and my wheelchair to get onboard…but all went well. Race morning I had a rather grim 3am wake-up call, as did my fantastic volunteer helpers, who had come forward after a Facebook plea by Caroline Gaynor and the Cozumel Ironman community, aided by Dailene Erikson. All four of them met me at my Hotel at 5:15am ready for the coach down to T2. Because of the split Transitions and Swim start/finish, I had Salim and Chris stay in T2 at the water exit after helping prepare my bike, whilst Rhonda and Pascal accompanied me back on the bus to the swim start. Ironman Cozumel Officials had arranged for all AWD (or PC) athletes to start after the Pro women at 7:20am, giving us a 10 minute lead on the mass of Age Groupers and their rolling start. With the bus delayed, Officials cleared the way through the gathering crowds to the start Pontoon, where I barely had time to finish putting on my wetsuit, hat and goggles, before the horn went off. It was odd swimming on my own, as a female duo were ahead, and the two male athletes were behind me. I tried not to be distracted by the marine life below me and concentrated on holding my form for the straight line 2.4 mile swim. I was passed by only the fastest Age Groupers, and surprised my Handlers who were helping the female duo out the water, one minute ahead of me. As I was carried out of the water by Chris and Salim, I could see Rhonda and Chris on the other side of the barrier out of the corner of my eye, hoisting my wheelchair aloft! I didn’t get to use it and was carried round the changing tents into T2, where I used two chairs which had appeared overnight (thank you organizers-I thought I’d be groveling around on the sand getting changed) to strip my wetsuit and put on my cycling top. Then it was onto the bike, getting my nutrition under my waist strap, and being escorted out of T2 by my helpers, to start the 112 mile cycle. Ironman Cozumel is a three loop course round the Island, with little in the way of elevation, but plenty of wind to make up for it. Aid stations were plentiful and I switched bottles of water for ice cold ones with only a few mishaps, including one where I was smacked in the face with a bottle by an over zealous youngster, and losing two as they bounced out of my bottle cage on the rough surfaces. Halfway on the bike is the toughest point, where my arms ached and I knew I had the same distance to go, but at least I was not on my own out on the course. The rolling swim start meant there were plenty of other athletes still out, despite my long ride. Into T2 and so overwhelmingly glad just to make it there, after my disappointment in Kona only six weeks previously that I took my time, got into my day chair, rolled into the changing tent, applied sunscreen and put on compression sleeves to help my arms in the final 26.2 mile Marathon, then got into my race chair and rolled onto the run course, wondering how I would feel, having never had the chance to do a full Marathon after 114.4 miles using just my arms! All the training, all those brick sessions of hard hand bike rides and run intervals immediately paid off, as I picked up the pace on my first loop of three, accompanied by a cyclist with a whistle clearing the way for me. The course is relatively flat and I benefited from the tailwind on the return section of each loop. Until I got a puncture, that is. A sickening hiss and I looked down at my right wheel, flat as a pancake. Not an ideal situation with a little over 5km to go to the finish line. My cyclist radioed for a mechanic to no avail and we tried to inflate the tyre with a Vittorio Pit stop I had in a bag attached to my race chair. I was running on full disks with tubular tyres and the valve needed a 90 degree adaptor, which I had, but we failed to fix it. I decided to carry on and roll on the flat tyre, hoping the carbon disk wheel would not be damaged in the process. I simply had to finish, there was no other option. I was so frustrated, it was so difficult to push the racing wheelchair with a flat tyre, other athletes were now passing me and time was slipping by. 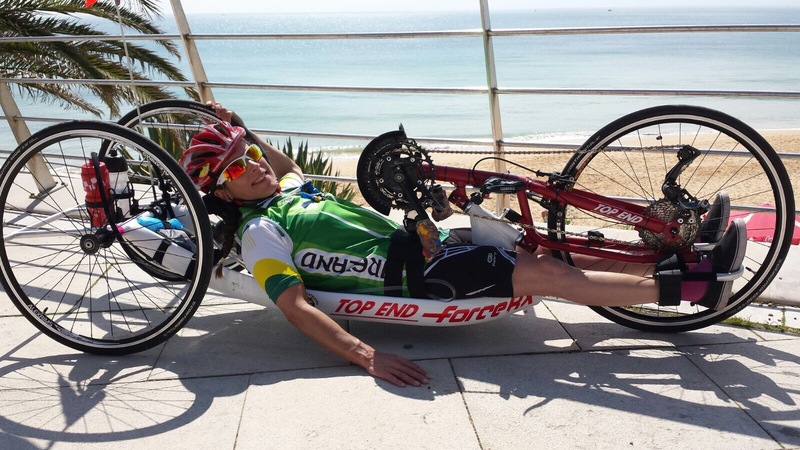 I’d had the aim of trying to beat the current Ironman world record for a female wheelchair athlete in a recumbent hand bike and had been aiming for a three hour Marathon. I couldn’t believe it when I finally hit that iconic red carpet, arms burning, to hear the announcer proclaim: ‘Elizabeth McTernan, you are an Ironman’. Incredibly, I also managed to set a new world record completing my first full Ironman. I owe a great deal of gratitude to all the people that help me achieve my goals; all my sponsors, my race volunteers and helpers, my family and all the lovely people I get to meet meet doing this fantastic sport. My second Ironman 70.3 competition took place in Luxembourg on June 18th. After discussions with my Coach, Dr. Ralf Lindschulten, I had the new and exciting aim of trying to qualify for the Ironman World Championships in Kona, Hawaii on October 14th, and this race was one of only three qualifying races worldwide for Handcyclists. I loaded up ‘Viva’ the VW Van with all my race kit and camping gear but sadly my two elderly dogs had to be put into Kennels. We have had many adventures in Europe the last two summers, but both are well past retirement age now. It felt very odd to be boarding the EuroTunnel without them, by-passing the Pet Control, but it’s certainly quicker to be traveling solo! I stopped overnight at my favorite campsite outside Calais and travelled the next day to Port de Schwebsange, where I set-up base camp close to the river, only 5 km away from the race start in Remich. I always find campsites in Europe incredibly accessible, with great toilet facilities, ramps everywhere and helpful staff, but this particular one turned out to be absolutely stellar, especially in relation to my race preparations. As usual, there are a few harder, but shorter sessions to be done before Race day on both the bike and racing chair, so I trained on the wide bike path between a quiet road, and the Moselle River. Then it was off to the race Expo for Registration, packet pick-up and race briefing, where I met the other Handcyclists competing. I didn’t want to have to detach the awning from my VW Van to drive to the race venue as it was so close, but it’s impossible to move both racing wheelchair and hand bike by myself whilst self-propelling a manual wheelchair. Luckily for me, Rent-a-Bike, Miserland, were right next to my camping spot and had offered mechanical assistance when they saw me setting up. They arranged for me to have use of their long wheelbase van and we loaded up all my equipment and dropped it into transition. The race directors had arranged two helpers for me, but they were not available until race day morning. I always worry that I will oversleep on race day morning, but the weather was so hot that it was difficult to sleep in the van at night anyway, plus our actual race start was scheduled for a very leisurely 9:05am! Arriving in transition at 7:00 am I met my two handlers and ran through what was required in helping me transition from one piece of adaptive equipment to another. They helped pump tyres, attach nutrition, fill bottles and got me into my wetsuit, then we rolled over to the swim start. This Ironman race had the newly introduced swim ‘rolling start’ but the Handcyclists and Physically Challenged categories had a glorious 10 minute head start on the Age Grouper Athletes, as we were straight after the Elite Men and Women. This meant that only the quickest swimmers caught us up and I had a lovely relaxed swim without being hit, swum over or kicked! And it was a massive PB! T1 was unhurried as there is no need for super quick transitions at 70.3 IM level. My Coach had given me a race plan in Watts for the bike, as although the first 35km are very flat, the course then winds through both France and Germany with plenty of hills to climb. Plenty of support at the roadside kept me motivated on the 90km ride, and I was able to help a man struggling, walking up a hill, who had obviously ‘bonked’ (run out of energy), giving him a Clip bar that I didn’t need. He soon peddled past me, shouting his thanks. I came into T2 a little later than I had predicted, and wasn’t surprised to see Jetze Platz, a Dutch Paralympic Handcyclist had already finished his race! It transpired he was 8th overall male, beating some pros! Off onto the run with the heat rising, lots of other athletes on the course, paper cups and sponges strewn all over the road. The run was a four lap course, each athlete having to collect a different colored band at each checkpoint. This turned into quite a game, with me approaching at speed on the racing wheelchair, sticking my arm out and the young volunteers snapping it over my pushing gloves and onto my wrist-they scored every time! To my amazement, I did a new stand-a-lone Half-Marathon PB, despite people dodging, cups and sponges. The good thing about a four lap course is that you pass the same athletes again and again, so they are then aware of a wheelchair racer coming up behind. Of course, in an ideal world, we would have a separate lane for safety and to avoid any accidents, as they do in Sprint Paratriathlon. However, everyone without question, was accommodating and encouraging, which I am thankful for. When I finally rolled along the Ironman red and black carpet, I had to hold my competitive side back from sprinting for the line, and instead, savor the moment, and contemplate the journey that has got me to the finish line in the first place, and earning my qualifying slot to the World Championships! Words can hardly describe how it felt to finally push myself along the finish chute at the Ironman World Championships in Kailua-Kona, on the Big Island of Hawaii, with Mike Reilly announcing my name to the huge crowds, ‘Liz McTernan, you are an Ironman!’ Then to be greeted by my daughter Rebecca, running up the carpeted ramp to kiss & hug me and present me with my shell Lei, was a very special moment in my life. It’s not my first Ironman of course, having already attempted to finish this iconic race in 2017, and then going on only six weeks later, to complete my first full Ironman in Cozumel, Mexico- just to prove to myself that I could do it. Another long year of tough training, another qualifying race in Luxembourg and I had earnt my slot to ‘The Big Dance’ once again. What is remarkable is that I’ve just become only the second ever female hand cyclist to finish the race and have set a new course record of 14:21:12 hrs. The course for the Ironman World Championships is tough, without a doubt, with a combination of heat, humidity and hills plus fierce winds to contend with, but the mens field seems to have increased in-depth and performance since Hand cycles were allowed to race in 1997, with Australian John MacLean being the first Physically Challenged athlete to finish. For whatever reason, very few women have attempted the challenging course. I now know of two other female world-class athletes who are preparing to tackle Kona as Hand cyclists, but not until 2021, after the Tokyo Paralympic Games. Currently, there are five qualifying slots worldwide for men, but only three for women, and only three qualifying races in the world in which to claim a Kona slot. I’m hopeful that in 2021, all three slots will be hard to earn and the standard of performance will be even higher, with more female hand cyclists setting their sights on the Ironman World Championships! T.Balfe Construction for providing a much-needed cash injection as I booked all the Kona accommodation and flights! I’m not sure what happened this year, but life seems to go by so much faster nowadays, with a great deal of Ironman training to cram into each passing week, and I simply have not had the energy or time to update my Blog. I’m heading to the Big Island again! I guess that I must be a glutton for punishment, or I have caught the Ironman ‘bug’ which compels me to train and compete at long distance events. I actually love all the training, especially when I can see improvement in ‘B’ races that I do for fun, or when I achieve a new Personal Best. I know that since I changed Coach earlier this year, and added weight training back into my schedule, I am fitter and stronger and less prone to injury than in previous years. I’ve changed my race chair position, thanks to input from Paralympian David Weir, and improved my race bike fit with the help of Chris at Draft Wheelchairs. At the moment, I’m fine-tuning my diet in favor of eating what my body tells me it needs, and fueling my workouts properly. My Coach is an advocate of ‘active recovery’ days, but I’m not afraid of dropping or changing workouts if I feel that my body is not recovering properly. But it’s the mental side of things which I have struggled with just recently, compounded by some external events and personal struggles plus an injury, which has made me doubt myself and my abilities to finish the Ironman World Champs on my second attempt. The Chimp on my back is telling me that I haven’t done enough, that I should have pushed harder in workouts, lost some weight, got my new push gloves in time to improve my wheelchair technique, got more sponsors on board so that I didn’t struggle financially, slept better, eaten better…that I only have four more weeks to put it all right. Then I smash out a ten minute PB in a Half Marathon race and I know everything is moving in the right direction, that all those hard weeks of training are leading me inextricably towards my third, and possibly my best, Ironman. My Ironman journey has been without doubt, arduous. The long months of training outdoors, on the hand bike and race chair, over the last year, in all British weathers, tested my resolve to carry on, at times. Frequently, I have had to fight for the right to space in a public swimming pool lane, when people assumed I was not a ‘proper’ swimmer as I do not use my legs…I’ve followed a strict LCHF diet for six months, training low and aiming to race high, to tap into my fat reserves and not rely on a constant carbohydrate/sugar intake come race day. I lost 4.5kg of body fat in the process, something I’ve struggled with post-menopause. I’ve also tapped into every resource that I possibly could, for those ‘marginal gains’ and more, that are so important to success. My lovely sponsor Huub Design adapted a 3mm wetsuit into a pair of ‘kick pants’ for me, and TYR donated a top-of-the-range swimskin, plus goggles to use come race day. Duncan and Topliss supplied a brand-new Zone 3 long course Tri-Suit. The University of Lincoln did my Lactate Threshold testing for me, which saved expensive trips to Hannover to see my Coach, Dr. Ralf Lindschulten. I was also able to be tested in my racing wheelchair for the first time on a treadmill, so Ralf could dictate my training better. Sheffield Hallam University Lab For Living, 3-D scanned my wetsuit clad legs and 3-D printed a pair of knee splints for my open water Kona swim. I contacted Ingenium in Illinois who make 3-D printed push gloves for the racing chair to improve my power transfer on the push rims. Sugru offered me more free supplies to mould some new hand cycle grips, so I could avoid blisters cycling 112 miles in the heat of the Queen K Highway, and avoid having to put on cycling gloves in T1. VivoLife sponsored me with Vegan protein and Electrolyte products as I wanted the cleanest products possible that would not affect my sci impaired digestion. I used my Fogarty Products sponsored VW Van to travel to Luxembourg and camp to compete in my qualifying race. I spent weeks and months exploring avenues for sponsorship, setting up a CrowdFunding campaign, sending out letters to local Companies, applying to Charities, doing talks at Schools and Companies. I did attract new sponsors, but I still relied too heavily on my credit card, getting into serious debt, all to fulfill the dream of competing at the World Championships in Kona, Hawaii. After all this preparation, I failed to meet the combined Able-bodied swim/T1/bike cut-off of 10:30 hours by less than 1:30 mins. This frustrating and disappointing result was because of my inability to do simple maths due to a neurological impairment acquired during my sci accident in 2005. I’d also not set up my PC8 computer to show the correct time in Hawaii-it was still set on UK time. I simply thought that I had more time. It was a NBC TV crew who first alerted me to the chance that I might not make the cut-off, but I was still about 27.2 km from the finish. I went into TT mode, making a promise to myself that I would bury myself on the bike to meet the cut-off. Everyone I passed shouted, ‘You’re going to make it’ and I rolled into T2 with a smile on my face, only to meet a blockage of officials, camera crews, my Coach and my daughter, Bex. She hugged me, and Ralf held my limp hand as the race official told me I’d missed the cut-off. I simply couldn’t believe that I’d disappointed so many people who had helped me on my Ironman journey. I was devastated that I couldn’t carry on, knowing that my run in my racing wheelchair would have been faster than most of the Age Groupers currently out on the course. I was very fortunate to have my Coach Ralf over in Kona and he was given permission to do a scientific study of my blood Lactate after each discipline. My actual swim time for 2.4 miles was 01:15: 28 (from my borrowed Garmin 920xt) but my chip had not registered when Ralf and volunteer Nathan had carried me up the steps into the shower and across the timing mat, so they had to carry me back over it… My official time was therefore 01:18:56 and my Lactate suggested that I had gone a little too hard. However, my Lactate after the bike showed I had merely done a long endurance ride, despite my hard effort at the end. Of course, hindsight is a wonderful thing, and I should have pushed harder on the bike, which I was more than capable of. I kicked myself for virtually stopping at every aid station on the bike course, one every six miles, to douse myself in water to keep cool, as the temperature rose to 39 degrees Celsius and the legendary winds battered me from every direction throughout the course of the day. I’d stopped at Special Needs after the turnaround to ask a volunteer to top up my camelbak, replace one of my drink bottles and pick up my spare nutrition, most of which was not consumed. I didn’t want to throw away my drink tube, so I wound it up and stuffed it under my lap belt. I perhaps stupidly, made sure to give a Shaka sign every time I was given one by volunteers and spectators. I was staying in the moment, but not focusing fully on my race. Unfortunately, the build-up to race day had not been ideal as both my hand bike and racing wheelchair arrived damaged via American Airlines from Florida, where I’d spent a week acclimatizing to the heat and humidity, in preparation for Kona. The wheel guards on both sides of the race chair were bent and split making it impossible to mount my disk wheels. They were temporarily fixed with a hammer, a block of wood and a metal file. The front mech on my new bike was bent and the Di2 would not shift from large to small chain ring, which I needed to tackle the 1138m of elevation. It took two days to eventually have this repaired after trying numerous bike stores and Exhibitors stands. Ceepo, a sponsor of Laura Siddall, a Pro Athlete who used to reside in Lincolnshire, kindly helped out. interspersed with tackling bike and race chair repairs, was a keen Media interest in both my back story and my attempt to be only the second woman to complete the Kona course. I attended three interviews in one day, having already given more than four before I’d even left the U.K. I was also keen to represent the Challenged Athlete Foundation as much as possible and took to the stage in the Athlete Village on a Charity Panel and completed a practice swim and photo shoot with other challenged athletes. I’d only arrived in Kona late Monday evening, and race registration, bike racking and a meeting with my Coach needed to be done, as well as some training! Plus my Parents had traveled out to Kona to watch me race and my daughter Bex had come as my carer and support, so some time had to be made to accommodate their wishes too. It might seem strange that I would choose to do an Olympic distance Triathlon when I am training for a full distance Ironman, but I love competing in the NYC Triathlon! It hosts the Accenture Challenged Athlete Foundation International Championships, which is the only race, worldwide, that provides a prize purse for Para Triathletes. CAF also provide travel stipends for International athletes to attend, which makes traveling to New York in the summer from the U.K. a little more attractive! I’ve competed at this race twice before, and been on the Podium both times, being overall female winner in 2016, based on a ‘par’ system for all categories. My friend Carolynn, from Washington State, travelled up on the overnight bus to do crowd support as usual and I had been allocated volunteers Carrie and Brian as PT Handlers for the race. Everything about the race is superbly organised, from the briefings, road closures and volunteers. However, transition, as always, is a logistical nightmare, with two pieces of adaptive equipment to juggle in a small allocated space, grass with bumpy matting, steep inclines out, gravel, tight corners and lots of people! They say knowledge is power, however, and since I’m already aware of potential problems, I knew what to expect on race day. I’d also had a chance to cycle and do a practice run in Central Park having arrived a few days earlier this year and staying at a more central Hotel. The weather had been unexpectedly wet and windy though, and I had to wash, plus try to dry, my hand cycle cushion in my tiny Hotel bathroom the day before my race! I really enjoyed my race, I had lots of support for me as a CAF athlete-I’m proud to have their logo on both my bike and my Tri-suit-from both spectators and other athletes. I managed the fastest swim of all the challenged athletes in my wonderful Huub Design 3mm wetsuit, ‘chick’d’ another male hand cyclist out on the bike course, and had an incident free run in Central Park, thanks to a superb lead cyclist clearing the way. With the disappointments of 2016 behind me, I decided to have a ‘Gap Year’ from Para-cycling in 2017, and pursue the goal of completing a 70.3 Ironman in Haines City, Florida. My racing wheelchair ‘Chameleon’ was dusted off after a three year hiatus, and I started swimming regularly again, relying on my Coach Dr.Ralf Lindschulten http://www.lindschulten.de to juggle my workouts and schedule. I was lucky to be invited to Florida with my Coach and other European hand cyclists to join a training camp run by Paralysed Veterans of America (PVA Team ) in Brooksville, Florida, in February. The Withacoochee State Trail, 46 miles of paved trail, was ideal for doing my long 4:30 hr endurance rides on my hand cycle, and I clocked up an incredible amount of training over two weeks, as well as being Lactacte Threshhold tested by Ralf in ‘Das Pain Cave’ whilst there! The next warm weather training was in Portugal in March, where I stayed with friends of Mark Rohan, the Irish Paralympic Handcyclist, for two weeks. I had access to the City public pool and 1.6km park path, so was able to train in all three disciplines for two weeks. A friend, Luke Delahunty, an Invictus Games competitor, was very fortunate to win a weeks cycling holiday to Greece offered by greekcycleholidays.com on the Island of Evia, and asked if I’d come. It was two weeks before my Ironman race and involved taking all of my race equipment with me, including spares and race wheels for both my hand cycle and race chair, as my flight to the U.S. was the day after we returned. But sorting difficult logistics for races are my speciality after years of solo competing! Steve Frost, the owner of @GCHols, and assistant Lilian Pitsa were amazingly helpful-from the delicious ‘athlete food’ served daily, the lifts down to the seafront for my ‘brick’ sessions, and making the Villa completely accessible with hand-built ramps- I was able to put the finishing touches to my Ironman preparations, with lots of great riding, scenery, food and weather. I arrived in Orlando, Florida, a week before my race, to high temperatures and humidity. Luckily, all my specialized equipment arrived intact thanks to my specially constructed box: http://www.dssmith.com/plastics/about/newsroom/2017/2/handcycle-box-for-world-ranked-para-cyclist. Unfortunately, I had to get my hand bike fixed at http://bikeshopofwinterhaven.com after my previous flight had caused damage. The mechanics were amazing, staying late to sort my gearing and Di2 so that my bike was race ready. I was kindly taken out to the Fraser Trail by Kris who works at the shop, to do my final hard interval training just days before Ironman 70.3 Haines City.